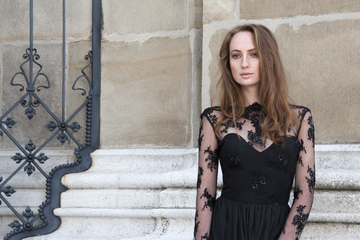 The extravagant dresses by Elisa Malec are made of the most precious materials worldwide like silk, lace and cashmere. The elegant designs are embroidered by hand with crystals, amber, pearls and gold pieces. To complete the glamourous look Elisa Malec creates matched Accessoires to the clothes. Timeless elegance and the carefully production in Austria make these luxurypieces to favorites in everyones wardrobe. The fairytale robes by Elisa Malec are made of the most precious materials worldwide like silk, lace and cashmere. The elegant designs are embroidered by hand with crystals, amber, pearls and gold pieces. Because of the fashionable style, the dresses fit every princess. To complete the glamourous look Elisa Malec creates matched Accessoires to the clothes. All luxurypieces are carefully made in . The materials have a quality certification and are traded fair. Timeless elegance and the carefully production in make these luxurypieces to favorites in everyones wardrobe.